Search for the best flight prices from Manchester to Avignon. Compare prices, book today and save money with Manchester Airport. 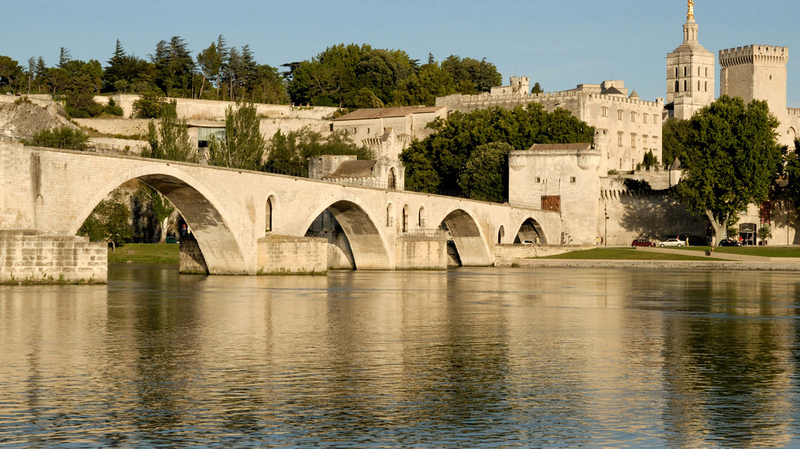 Richly cultural Avignon, ancient home to Popes and kings, is a mere 50 miles or so from the delights of the French Mediterranean coast, but feels a world away. Eminently explorable on foot, it's the perfect place to immerse yourself in history, and even go sur le pont (which part-crosses the beautiful river Rhone), just for the sake of it. Superbly preserved in all its medieval grandeur, central Avignon is a living museum. The high-end hotels here are mainly housed in historic buildings - five-star La Mirande (4 place de L'Amirande) was built on the ruins of a cardinal's palace, while the Hotel d'Europe (12 place Crillon) is the ancestral home of the Marquis de Graveson. Mid-budget travellers can still experience traditional luxury at the 19th-century Hotel de l'Horloge (1 rue Felicien David). If you're looking for something more contemporary, Novotel Avignon Centre (20 boulevard Saint Roch) has a swimming pool, spa and underground car park. Hotel de Blauvac (11 rue de la Bancasse) is a good budget option. Shopping in Avignon is the antithesis of big brand commercialism. The cobbled pedestrian lanes are lined with enticing boutiques that lure visitors with exquisite-smelling produce. The local specialties are olive oil, lavender, olives and honey. Find the freshest and the most fragrant at the famous Les Halles market (Place Pie) or stock up on local delicacies at exquisite deli Les Delices du Luberon (20 place du Change). Avignon's designer stores are mainly clustered around Rue Joseph Vernet. If it's mainstream brands you're after, however, take a stroll down Rue de la Republique, where you'll find the Monoprix department store (24 rue de la Republique) with its classic mid-range fashion lines. The centre of the Provencal foodie scene and home to several Michelin-starred restaurants, Avignon is a gourmet's dream destination. La Vieille Fontaine (12 place Crillon) does fabulous French formality with aplomb, but La Compagnie des Comptoirs (83 rue Joseph Vernet) is a trendier option favoured by local food lovers. For steak to die for at pocket-friendly prices, pull up a bar stool at the Bar de l'Hotel de Ville (18 place de l'Horloge) - or take advantage of the mouth-watering set menu at Hiely Lucullus (5 rue de la Republique). Booking in advance is essential at most good Avignon restaurants, particularly during the summer months. A must-see for anybody with equestrian leanings, Cheval Passion is an incredible display of creative horsemanship. Outside the main shows, visitors are encouraged to find out about stud farming, horse care and training for an equestrian career. This winter festival was established in 1979, and has since grown to international proportions. It focuses on contemporary dance, with events, classes and public performances spread across a week-long celebration of the arts. This is quite simply the biggest and most entertaining event in the Avignon calendar. Expect three fun-packed weeks of dance, music and theatre, as well as films, circus performances, exhibitions and debates. Running alongside the official Festival d'Avignon is a programme of fringe events, many of which are free to attend. Over three weeks in July, the Old Town becomes a giant stage where artists, circus troupes and entertainers ply their crafts. Behind the serene skyline of historic Avignon is an edgy music culture that finds expression in a series of annual festivals. The Avignon Blues Festival is one of the most popular, and is focused around the Salle Polyvalente in Avignon suburb Montfavet.